Attorney General, Basil Williams on Wednesday contended that a request for the Court of Appeal to urgently hear an appeal concerning the appointment of the Chairman of the Guyana Elections Commission (GECOM) would amount to a challenge to the validity of the Local Government Elections scheduled for November 12. Williams’ contention was in reaction to oral submissions by Attorney-at-Law, Anil Nandlall-on behalf of Executive Secretary of the People’s Progressive Party (PPP), Zulfikar Mustapha- that an early hearing is necessary to allow for an eventual final appeal to the Caribbean Court of Justice (CCJ). Chief Justice, Roxane George-Wiltshire on June 8 ruled that President David Granger was constitutionally right to appoint Retired Justice James Patterson as Chairman of the Guyana Elections Commission (GECOM). With Local Government Elections set for November 12 and general elections expected to be held no later than August 2020, he emphasised that, “it is imperative that we hear the matter in such a time-frame tat would allow the ultimate and complete disposal of the issue within the legal system of Guyana. In other words, this appeal, I respectfully submit, ought to be heard so early so as to permit any challenge of its decision to be completed before the CCJ before elections,” he said. The Court of Appeal adjourned the case until July 27 to allow the Attorney General’s affidavit in answer to be amended and then served. The case was called on Wednesday, one day after the Attorney General’s Chamber’s filed an affidavit in answer to the first one filed on June 12, 2018. “Over a month a half has elapsed yet the Honourable Attorney General was unable to file an answer,” Nandlall told the Court of Appeal. “This is a matter of public importance, a matter of national importance. I did not think I would need a sledgehammer to kill an ant,” he added. However. the State is of the view that Mustapha “must establish urgency to warrant a grant of his application for his matter to be heard before other appeals which are first in time to his but he has failed abysmally to do so”. Stressing the importance of having an early hearing of the appeal of Chief Justice George’s decision, Nandlall urged the Guyana Court of Appeal to “emulate” the CCJ’s approach in which it had heard a matter within weeks and handed down its decision on a Sunday so that an elector in Barbados could have known his fate before the recently held polls. Nandlall assured the Court that there was no need for lengthy oral submissions because all of the “copious” submissions in the High Court matter are all there and that the appeal “will turn on a singular” provision of part of Article 162 of Guyana’s constitution to prove that the Chief Justice erred in her decision. “The case simply involves the interpretation of a paragraph in our Constitution or an Article in our Constitution that is less than a quarter of this page; not more than ten or fifteen lines; that is what the appeal is about,” he said. In that regard, the State’s case, in the affidavit in answer, is that the PPP’s Executive Secretary, Zulfikar Mustapha has not put forward an arguable appeal that the Chief Justice erred in exercising her discretion. Additionally, the State’s position that the President acted constitutionally in selecting a person from the judicial category of persons having found the Opposition Leader’s list unacceptable. 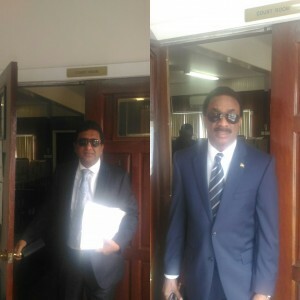 Attorney General Williams, however, argued that there are numerous precedents to support his contention that a challenge such as this one has the effect of challenging the validity of an elections which could only be done by way of an elections petition. “This is what is being challenged- that you cannot have a valid election with Justice Patterson being the chair,” he said, adding that he was convinced that the case “would not go past the submission”. He said the validity of President Granger’s appointment of Justice Patterson as GECOM Chairman was confirmed by the Chief Justice and monies have been already spent on registration. In the affidavit in answer filed on behalf of the Attorney General, the State’s position is that the Court of Appeal has no basis to hear the appeal earlier than it might be scheduled. “The respondent will further contend that the Court, with scarce resources, is burdened with a number of appeals and it is incumbent on the appellant/ applicant to establish that his appeal has reasonable prospect of success and exceptional circumstances to cause the court to exercise its discretion to abridge the time in his favour,” the State said.